After pumping out hundreds of lightning quick microgames for the WarioWare series, it's up to you to design the next moneymaker for WarioWare Inc. Your tool? WarioWare: D.I.Y., the Nintendo DS game that lets you create games from scratch. What could me more perfect? The WarioWare series, famous for its lo-fidelity presentation and hasty game length, is an eclectic collection of single-command challenges that exist only for a few seconds. WarioWare: D.I.Y. gives players a chance to create custom graphics, music and game rules, then play those microgame creations alongside the built-in ones or share their homebrewed ideas with friends. Your oddball nose-picking game or Super Mario Bros. spin-off will fit right in. WarioWare: D.I.Y. is less of a game than a toolbox, a rare chance to create a video game in a matter a minutes, not months, all done with the intuitive Nintendo touch. WarioWare Micro-charm Intact: I love Wario as a character and he serves as a great foil for your instructor, Penny Crygor, to bounce insults and banter off of. Although the beginner tutorial's can be long-winded, the rapport between Penny and Wario makes it worthwhile to pay attention to their crucial lessons. Having access to plenty of WarioWare-themed stamps in the MakerMatic Comic creator is also a Wario plus, if only for the fart cloud stamp. Programming Disguised As Puzzles: After the rather lengthy and mandatory D.I.Y. tutorials—they'll consume a good two or more hours of your initial hands-on time with WarioWare: D.I.Y.—you may have the burning desire to express yourself creatively with the Game MakerMatic... but don't miss the Assembly Dojo. This section of WarioWare Inc. offers small game design challenges, essentially tasking you with filling in one missing piece of the game design puzzle. These include things like setting conditional timing and behavioral triggers—make a ball roll when a light turns green, fit one object inside another when tapped. Your choices will be judged by the Assembly Dojo master and you'll learn valuable game design techniques that fall outside basic D.I.Y. design. It's what we call "edutainment." Game Plagiarism Is Fun: For the impatient microgame developer, WarioWare: D.I.Y. lets the player steal just about anything—art, music, and even entire games if you want to. Not only is this incredibly helpful in speeding up the process of getting a customized microgame in your D.I.Y. library, designers will get valuable insight into the workings of the microgames created by the WarioWare team. Take It To The Wii: Nintendo DS owners who want to see their microgame creations (or those of a friend) on the big screen can do so with the WarioWare: D.I.Y. Showcase app released via WiiWare. It's another 800 Nintendo Points ($8.00 USD), and of limited use without a copy of the DS game within reach, but it makes game sharing (and showing off) much more exciting. Limitations & Interface Frustrations: Don't expect WarioWare: D.I.Y. to be able to perform your wildest game design dreams, as some of the software limitations can dampen your creative spirit. The game doesn't take advantage of the DSi's features, so players can't import photos for backgrounds or import game sprites from an SD card. The game's stamps are single-frame, so you'll have to animate that Mario sprite yourself, and the limited triggers may not feature the flexibility you're looking for. But it's the limited interactivity with the Nintendo DS hardware itself that may be most disappointing. Players are essentially limited to touchscreen taps, leaving the rest of the hardware's input options underutilized. A Long Journey To Fun: Getting to the meat of WarioWare: D.I.Y. takes a more substantial time investment than the series famous for its tiny session gaming has conditioned us to expect. Unlocking the game's full set of built-in WarioWare games may require players to do more than they bargained for, crafting comics, compositions and taking a crash course on game design to get access to the pre-made stuff. That can become frustrating when you really want to borrow some of 9 Volt's game assets for your NES-themed microgame creations. Think not of WarioWare: D.I.Y. as another collection of microgames with an editor as welcome afterthought, but the inverse. The game creation tools, which are easy to learn, fun to use, and often surprisingly deep when fully explored, are the main draw. The 90 built-in games serve largely as professionally crafted microgame examples for players to dissect, little more than future design templates. WarioWare: D.I.Y. is improves when combined with the WarioWare: D.I.Y. Showcase—which adds another 72 pre-made microgames to the mix—and the Nintendo Wi-Fi Connection, which will provide fresh weekly downloads after the game's release. The long-term appeal, however, is tapping into your own creative abilities and those of the inevitably impressive D.I.Y. design community. 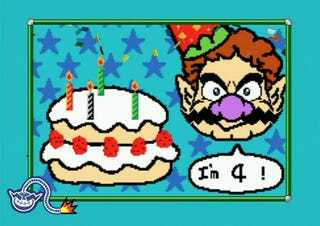 What you'll get out of WarioWare: D.I.Y. is what you'll invest in it—and it's a wise investment. WarioWare: D.I.Y. was developed by Intelligent Systems/Nintendo and published by Nintendo for the Nintendo DS on March 28. Retails for $34.99 USD. A copy of the game was given to us by the publisher for reviewing purposes. Completed all tutorials and Assembly Dojo challenges, then created about 20 microgames, four comics and three nigh-unlistenable musical compositions.